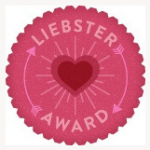 Earlier today, my friend Gabi nominated me for the coveted Liebster Award! Yay! In order to accept this super awesome award, there are Things That Must Be Done. 2. Display the Liebster Heart on your blog. 4. Post 11 things about yourself. 6. Answer the 11 questions you've been asked in your nomination. 1) If you could choose any book universe to live in, what would it be? Um, trick question? Harry freakin' Potter. 2) If you could guest star in any TV show, which one would you choose? 3) What do you keep in the trunk of your car? 5) Would you ever hug a complete stranger? 6) If you could visit a different decade or era, when would you go? Why then? Would you stay? I'm not sure if I would stay or not. I love where I am in time, knowing what I know and having knowledge easily at my fingertips. However, the romantic in me would probably overpower the practical side and I would stay. 7) What's your favorite OTP and from which fandom? 8) If you were stranded on a desert island, what three books and what three people would you want with you? 9) How would you like to be remembered? As somebody who loved people, and dedicated her life to making others' better. Best: "Do you have a whip? "-It didn't work, but it should've. Worst: "Miss, would you marry me? Imma be 18 in a few months..." -Didn't work, by the way. 11) What would your last words be before departing this world? I listen to *NSync on a daily basis. On Foursquare I'm currently the mayor of my local Wal-Mart. I am addicted to sitcoms. I want to visit Ireland more than any other place on Earth. When I was a kid, I had a crush on Jack Frost. I speak quite freely (which sometimes gets me in trouble). I don't like chocolate. I know, I break girl-code. I love to go shooting. I LOVE my job. Teaching is my greatest passion! My dogs' names are Spanky (giant German Shepherd mix) and Penny (tiny Pomeranian). Spanky is a baby and is terrified of Penny. Do you prefer Diamonds or Pearls? If you could travel anywhere to live, where would it be and why? What is your fantasy (as in, it doesn't exist in this world) career? With whom do you feel safest? Who is your guilty pleasure musician/band? Describe your feelings about public education. As I tell my students...proceed.